A Continental Tyres Cup match between Championship team Lewes and Arsenal. On paper a mismatch but Lewes qualified into the knockout stage of this competition last year against all expectations, and they were also ahead of us in the group table courtesy of a better first match goal difference, so not a team we were likely to underestimate. I got there early, leaving plenty of time for the hour and a half drive down from South London and arrived almost exactly an hour and a half after leaving so for once the sat-nav had a fair idea of the traffic situation. Just ahead of me was the Arsenal Coach and I was able to wish Jordan Nobbs and Louise Quinn a good match as they walked into the ground. I also chatted with our Manager Joe Montemurro for a few minutes. He is a really nice guy! I asked him about injuries and he said that both Jessica Samuelsson and Lia Walti were more-or-less back to full fitness (both started) and that he was quite happy having a small squad. For the second match running our subs bench had a goalkeeper, and one each of defender, midfielder, and attacker. He said that as he could only make three substitutions, why have more players sitting on the bench and not playing. Joe could of course have been making a virtue out of necessity – I know I would be far happier if we had more than 15 players at a match. Young midfielder Ava Kuyken was in America not back until early this week. She is the only one of our first team squad who isn’t a full international but he said that she is doing really well in training and will certainly get game time as the season. He agreed with my assessment that she certainly hasn’t looked out of place in the few minutes of game time she has had so far this season. He also asked me how I thought our men had got on against Newcastle – we agreed that they were far better in the second half. Lewes play at a ground called the Dripping Pan – a wonderful name and I asked the lady checking e-tickets how it came about. She told me that originally the monks from the local ancient monastery used to pan for salt in the natural depression in the South Downs hills. 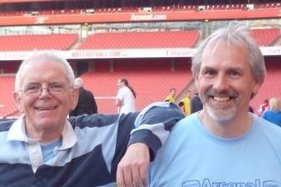 The first thing that struck both Pauline (my wife) and I was that the Arsenal players all looked smaller and fitter than the Lewes players – the difference between full time professionals and players who train three times a week after work we guessed. We were certainly quicker to the ball and far more adept with it. We got an early goal through Van de Donk in the sixth minute. Danielle was excellent all game and would probably have been Pauline and my player of the game. I noted that after 15 minutes we had by far the majority of the possession with a number of near chances and that there was a clear mismatch between the two teams. In Min 20 Danielle had a long range effort saved by Baker in the Lewes goal, a minute later we got our second through in form striker Vivianne Miedema. Four minutes later we had a third when a cross from the right wing went to the far side and Katie McCabe made no mistake from the left side of the penalty area. Min 27 and Miedema got her second with Arsenal now in full control of the game. Min 36 and there was an unintentional collision in the Lewes penalty area but it clearly impeded Danielle Van de Donk and the referee had no alternative but to point to the spot. I expected Miedema to take the penalty but our captain Kim Little was having none of it and she calmly placed the ball to the left hand side of the net, the keeper having gone right. Min 42 Nobbs tried her luck from range but the ball flew high over the goal. Right at the end of the half we got a second penalty, again no malice in the challenge but clumsy, Miedema being pulled down. Again Kim Little with an excellent penalty giving Baker absolutely no chance. So half time and we were six nil up and in complete control of the game Pauline Peyraud-Magnin had had virtually nothing to do except play out the occasional back pass. – the only question really was what the final scoreline would be. Min 48 and Danielle Van de Donk nearly added her second and our seventh. It wasn’t to be long in coming though as Lisa Evans scored in the 58th minute followed a minute later by Miedema getting her hat-trick. This was her second in consecutive matches – the previous Women’s hat-trick being by Kelly Smith in 2014. This was to be Vivianne’s last kick of the game as both she and Dominique Bloodworth were withdrawn, Louise Quinn and Beth Mead coming on. Minute 63 Lewes made a substitution with Shanon Maloney replacing Payne. Min 65 there was another good save by Wells, this time from Nobbs but an agricultural challenge on her a couple of minutes later saw us awarded a free kick immediately outside the 18 yard box. Kim Little placed the ball but then stood to the right by a couple of metres. The ball was tapped to her and her shot went in off the inside of the left hand post. To the Arsenal 9 – 0. Min 77 Lewes made another substitution with Owen coming on for Carter. Min 80 Lia Walti left the pitch after being caught on the foot, a couple of minutes later Leah Williamson came on. In the last 15 minutes or so Lewes had their best spell of thegame and could easily have got a consolation goal when a corner went right across our goal eluding everyone. Lewes made a final substitution with 4 minutes of normal time left. Larkin coming on for Quayle. The final score was 9 – 0. A thoroughly professional performance by Arsenal who’s team of International players were simply in a different class to the part-timers from Lewes. Lewes tried hard all game and when they recover and have a chance to analyse the game will be able to pick up a lot of things to enable them to become better players. They really aren’t a bad team, Arsenal, at the moment, probably have the strongest starting lineup in the country, but not the strength in depth of Man City or Chelsea the two Champions League sides. Next game on Wednesday evening – an away WSL league match against Yeovil who somehow earned a draw in the corresponding fixture last year, two points dropped which probably cost us the CL spot at the end of the season. The match is at Dorchester Town FC with a 19:45 kick-off. Any gooners in that part of England should enjoy a good match as we look to extend our winning run. I wouldn’t be at all surprised if Miedema makes it three hat-tricks in three matches. Our Academy squad beat Yeovil 15 – 0 in their opening fixture of the season – I’m sorry I have no further information than that but well done to our youngsters. also has a blurb on Lewes which I thought was quite good. Thanks for the write up Andrew. Nice pictures. Cit took me a long time to get used to looking through a camera viewfinder with one eye whilst watching the action through the other one. After a while you kind of see the zoomed in image as a closeup superimposed on the normal view. A bit weird at first but it works for me. That headline was rather misleading -could it not have been – ‘… with an Arsenal Manager…’ That is nearer the truth than what you have now. Don’t go down that route like the others do to get more clicks. Otherwise you risk displeasing your regulars to this site. Game Day 5 is complete. Anthony Taylor oversaw Southampton and Brighton draw (2-2). Craig Pawson still leads the referee treatment league with 18 treatments (none on Game Day 5). David Coote has done 1 game and oversaw 2 treatments, Paul Tierney has done 3 games and also overseen 2 treatments (4? ), while Christopher Kavanagh has done 3 games and overseen 3 treatments. From there, we jump to 8 treatments for Moss and Probert. I would say these 3 referees are outliers for a couple of reasons, one they don’t get games and two the games they’ve done have few treatments. Graham Scott is the only referee who hasn’t had a game with the same treatments observed, as what these 3 low treatment referees have had. So they really haven’t shown that they “perform” differently than the rest of the PGMO selection. I have still not seen any cards issued for simulation in these treatment situations. We did see a spud get away with violent conduct this game day (no card issued). The Caution league has Wolves with only 94 minutes of caution over 5 games (less than 20 minutes per game). Liverpool!! is second at 155 minutes (almost double). At the high end, Everton have 491 minutes of caution, an average of just under 100 minutes per game. The team that has “inflicted” the fewest treatments is Wolves (2). The leader is Southampton at 12, for which they have received 1 card. Really, Arsenal should be at 4, as two of those treatments were self-inflicted, not inflicted by Arsenal. It appears that Spuds, ManU and Man$ity are being allowed to kick other teams. 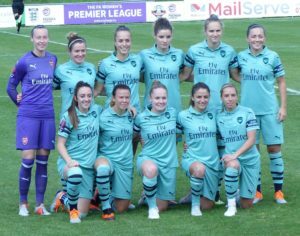 Still, well done, the girls wear the badge so they’re Arsenal too and deserve our full support .